Want a uniquely fun (and free) way to engage students in learning? Why not use comics as a way to spur student learning? In fact, I challenge you to set up an occasional 20-minute comic strip segment during which your students create a comix about something they learned or read or experienced that day. They can make their daily comix diary by using a comic generator, such as MakeBeliefsComix (or even by drawing their own comics with pencil or crayons if technology access is limited). 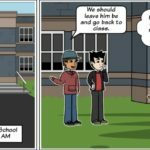 By creating comic strips, even with stick figures, students will realize that they can create stories and make art. They will learn that they, too, are capable of generating their own learning materials, their own memoirs, and that their ‘’take’’ on the world is so very special – everyone sees things differently. Moreover, the process of using drawn characters and writing words for them to in blank balloons provides a way for students to digest and integrate the key material that they are taught each day in school, as well as to reflect on their life experiences. NOW, WHAT TO DRAW AND WRITE ABOUT? For starters, why not have students create autobiographical comix strips talking about themselves and their families or summarizing the most important things about their lives? Let each student select a cartoon character as a surrogate to represent him or her. They might also summarize what their individual interests are or some key moments in their lives. Maybe students create a comic strip with a new ending for a book that they've read, or an extension of the story, or a deeper exploration of a character in the book. Maybe their comic is about a concept they learned in science or in social studies. Or, a moment of history. Maybe their comic is about something sad or bad that happened to them, such as someone bullying them. Or something special, such as a birthday wish. Maybe they're exploring a problem at home that's bothering them, such as a sibling who's driving them crazy. Maybe their comic strip is a fantasy story that arose from their imagination. How about a comic about someone who is very important to them? Perhaps about a hero in their lives or someone whom they admire. Or, a comic about a story that lingers in that student's mind. A comic strip about a favorite pet. A comic strip about some special family day, or a family story. How about a comic about their best friend? A comic strip about a dream they had, or one about a surprise they experienced. A comic strip about their lives in the future – their goals, their hopes. 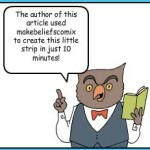 Have students draw or keep their comics in a special notebook or sketch pad, or place the computer printouts of the comics they create with MakeBeliefsComix in a special folder. Play some quiet music as they draw and write to create a restful mood as they create. Now, imagine the comic-filled sketch book or folder containing daily entries over the course of a year that will trace each child's thoughts and learning, that will reflect what was important to them. They'll have created a comic book diary that they will treasure for the rest of their lives. Most important, the 20-minute comix diary challenge gives them the chance to become creators as they find their voice, rather than just passive learners. What better gift can you give them? A journalist and prize–winning newspaper editor, Bill Zimmerman for 13 years created an interactive, syndicated Student Briefing Page for Newsday newspaper to teach young people about current events. It pioneered the use of interactive techniques found in his books to encourage young readers to express their opinions about the world they live in and brought in hundreds of thousands of letters. The page was nominated twice for a Pulitzer Prize. At Newsday, Bill also created a series of comic books to teach history and current events to young readers. Bill has also has written over 20 books, and his work has been featured on the Today Show, PBS's acclaimed Ancestors Series, in The New York Times, The Washington Post, The Wall Street Journal, USA Today, and such magazines as Family Circle, Parents, Esquire, Business Week, and Essence.